We present an optimization framework for graph-regularized multi-task SVMs based on the primal formulation of the problem. Previous approaches employ a so-called multi-task kernel (MTK) and thus are inapplicable when the numbers of training examples n is large (typically n < 20,000, even for just a few tasks). In this paper, we present a primal optimization criterion, allowing for general loss functions, and derive its dual representation. Building on the work of Hsieh et al. [1,2], we derive an algorithm for optimizing the large-margin objective and prove its convergence. 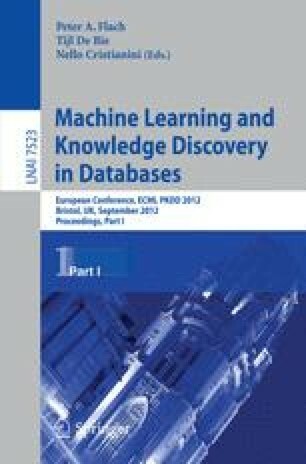 Our computational experiments show a speedup of up to three orders of magnitude over LibSVM and SVMLight for several standard benchmarks as well as challenging data sets from the application domain of computational biology. Combining our optimization methodology with the COFFIN large-scale learning framework , we are able to train a multi-task SVM using over 1,000,000 training points stemming from 4 different tasks. An efficient C++ implementation of our algorithm is being made publicly available as a part of the SHOGUN machine learning toolbox .